And it is a great lounge. Compromises have been made to adapt the popular Centurion Lounge concept to a smaller footprint. I think the choices made have generally been the right ones, though the managers I spoke to confirmed they plan to continue monitoring and evolving in this new territory. I’ll mention a few potential issues in this review, but none of them are worth avoiding the Studio. 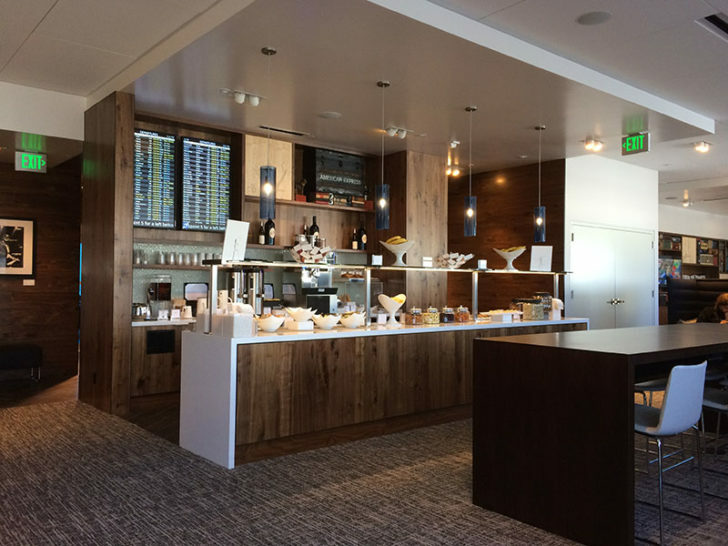 For comparison, my usual go-to in Seattle is the Alaska Airlines Board Room near Concourse C. It’s often busy, but it has good snacks, a friendly bar, and a great espresso machine. Meanwhile the Centurion Studio is smaller and has no cocktails, but the beer, wine, and snacks are a notch better. I’m almost always impressed by the service at the various Centurion Lounges, and it certainly helped that one of my readers works at the Centurion Studio and greeted me by name. 😉 Gift bags were provided for some of the first guests, so be sure to stop by if you’re planning on any holiday travel. There are no spa treatments or showers to reserve, but the staff could probably point you toward a good restaurant if you want a meal before your flight. Remember, the Studio only has cold snacks due to the limited kitchen space. As I’ll explain below, waiters provide all drink service in Seattle, but you’ll usually find them making a circuit in other Centurion Lounge locations, as well. The lounge was loosely organized into four regions. A tall bar ran opposite the buffet and along the windows. A mix of low chairs and tables were scattered to the right. And the left was divided between more mixed seating and a media lounge with a flat screen television and several large chairs. But it’s not unusual to see planes from the lounges in Seattle. I actually think you see more of them from the Alaska Board Room’s second floor and its view of the runway. What is unusual is the view of Mount Rainer. My photographs never do it justice. No hot food and no bar. Those things take up a lot of space — remember, the hot food requires a larger kitchen to prepare — so I think the Centurion Studio made the right choice in offering fewer dining choices but devoting more space to seating. As it is, right now the food consists of cereals and yogurt for breakfast. Cookies, dried fruit and nuts, and crudités are provided in the afternoon and evening; I shared the full menu in Tuesday morning’s announcement. I went straight for the cookies. Not because of my sweet tooth but because so many commercial kitchens do a poor job, and I think I’ve been baking long enough to tell the difference. I’m pleased to say the chef passed. They were some of the better sugar cookies I’ve had in a while, and the coconut macaroons were as good as it gets unless I bake them myself. I pointed out it would be nice to take a little more advantage of Seattle’s culinary scene. Cured meat from Salumi, Beecher’s Cheese, bread from Columbia City Bakery, and Chukar Cherries would all be nice additions. (Update: I’ve been informed the Studio uses bread from Macrina, which is another good choice.) But I wasn’t unhappy with the spread. Just enter with the right expectations. You can’t get a full meal at the Centurion Studio like you can at the larger Centurion Lounges. Likewise, space currently prevents the Studio from offering a full bar. Washington State has strict rules against self-serve alcohol, so it’s impossible to set out a few bottles and let guests pour their own drink. Instead, everything is kept in the kitchen, and servers came around frequently to ask what I’d like. I tried both the red blend and the Chardonnay. The former was pretty good, though I’m not a fan of most Chardonnays and this wasn’t one of the lucky ones. I don’t expect to ever see a full bar like you’ll find at the larger Centurion Lounges, which feature specialty cocktails. (The Blue Door cocktail in Dallas is worth a trip across the airport.) However, it would be nice if they could add some basic spirits and mixers to the menu — enough to pour a gin and tonic. A decent sparkling wine (Chateau Ste. Michelle?) would be an even easier improvement. Finally, a few readers have already mentioned the disposable plates and cups, and I brought it up myself in the lounge. They feel out of place in what is otherwise a very refined environment. (At least the wine and beer are served in real glasses.) Again, space is part of the issue, so I’m curious to hear your thoughts: Would you rather see Amex make the effort to use real plates and glassware like they do in other lounges, or is this much ado about nothing? Yes, the lounge is small. It’s about the same size as the United Club, although I think it’s better laid out with one large room instead of several smaller spaces. I spoke to the manager who confirmed it’s rated for an occupancy of only 101 guests. Even the bathrooms reflect the limited space: two unisex washrooms (fairly large, actually) replace dedicated facilities for men or women. The usual L’Occitane amenities are still there. I don’t think the new Centurion Studio is reason enough to get an American Express Platinum Card. It’s a little too limited to make that argument. But as part of the growing network in Dallas, San Francisco, Newark, Miami, and Las Vegas the case is made more convincing. Factor in the $200 annual airline fee credit and a variety of other benefits, and the Platinum Card starts to look like a good deal for some travelers. In Seattle particularly, the Platinum Card comes with a Priority Pass Select membership that offers free access to the Alaska Airlines Board Room, so now I have two lounges I can visit regardless of which airline I’m flying. I think they’re evenly matched in different ways, with significant potential for either to pull out ahead. My gate is usually in the other direction since I’m loyal to Alaska and American. But I expect I’ll still add a few extra minutes to my walk and head back to the Centurion Studio now and then. It’s nice to have options, and this is a very good option.